Is Dogecoin Dead? 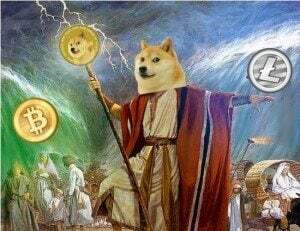 Or will Doge rise again? You are at:Home»Coinbrief»Altcoin»Is Dogecoin Dead? Or will Doge rise again? When Dogecoin debuted in December of last year it was greeted with great enthusiasm from fans of the Doge meme, and equally great skepticism about it’s viability from pretty much everyone else. Despite this uncertainty, the value of the new cryptocurrency rose rapidly leading the community to adopt the slogan “To the Moon!” as a rallying cry. Doge soon found itself in 3rd place on the Cryptocurrency Marketcap listings, and in just 90 days it had achieved a market cap of $90 million. And then, the rocket ran out of gas. After peaking on February 12 the value of Doge began a long, sustained drop in both total market cap, and individual unit price. There was an expectation in March that the downward slide would end after the community successfully raised $55,000 to sponsor NASCAR driver Josh Wise. Unfortunately, this did not happen and there was no real spike in Doge value until a three day period between April 14 and April 17 where $22 million dollars was pumped into the market before the slide resumed. Despite this, the Doge community continued to cheer on their currency, defiantly resisting the reality of the slow, inexorable decline. Their 87,000 strong community continued to post cheerful photos, positive memes, and generally behave in the carefree, highly positive manner that has been their trademark from the start. Then, last week we saw the dark, ugly side of Doge that no one ever suspected was there. For reasons that still remain unclear to this author, Ultra Pro, a collectible card supply company, decided to trademark the Doge meme. Not the word “doge” as in the Medieval ruler of the city of Venice, but the actual Shiba Inu meme. Crypto-payment processor, and long-time Doge enthusiasts, Moolah immediately responded on Twitter by saying “Trademark. Notice of opposition. Imminent filing. #dogecoin” which, in a move that is completely unfamiliar to the Twitterverse, confused a lot of people. This confusion caused a bit of turmoil in the Doge community, and the co-creator of the crypto Jackson Palmer, reached out to Ultra Pro to find out what, exactly, was going on. Ultra Pro claimed they had no intention of subverting the Dogecoin community in any way, shape, or form. Apparently satisfied with their assurances that they would not be interfering in Dogecoin-related enterprises, Palmer went to the Doge subreddit and relayed the good news. As well as his belief that Moolah was making a grab at the Dogecoin trademark for themselves. On June 28 Green published a blog post on Moolah’s official page attempting to clear things up a little. In a marked contrast to his previous (now deleted) statement on Reddit he adopted a clear, calm tone and appealed to the Doge community’s better nature as he tried to explain his side of things. Notably he addressed the allegations that Moolah investors were lacking in consumer protection and that he (Green) was going to abscond with the $330,000 that Moolah had raised. Yesterday it was announced that a new Dogecoin Foundation was being formed with the new starting roster consisting of Felix von Drigalski, Jens Wiechers, Steven Hirschmann, Josh Mohland and Debbie Ballard. Former Doge Foundation member Eric Nakagawa (who had departed the Doge community at roughly the same time as Palmer) expressed a renewed interest in the community and a desire to work with this new Foundation. It remains to be seen if that will happen, and what the Foundation plans to do about Dogecoin which, no matter how you look at it, is in serious trouble. As I have stated previously, the value of Doge is down dramatically from it’s peak in February which is not good news for the dozens of merchants who accept doge as legal tender for transactions. For instance, remember when Alex Green accidentally donated 20 million doge to the Josh Wise NASCAR campaign? At the time that was $15,000, roughly one-third of the $55K total. If anyone were to donate 20 million today they would only be worth $5,264 a substantial difference. As you browse the Dogecoin subreddit you see numerous armchair economists and stockbrokers advising the uncertain to “stash your doge in paper wallets and hold onto them” because they sincerely believe that doge, a tipping currency, is going to gain value somehow. The idea that the laws of supply and demand might somehow affect the cost of doge is fiercely refuted by completely illogical and counter-intuitive arguments that range from the absurd to the insane. Some people argue that doge is down because Bitcoin is down (regardless of the reality of their respective prices), or how block halving rewards will only drive the price higher because lower block rewards aren’t going to stop miners from leaving doge (it has so far), or other equally nonsensical arguments. The first order of business for the Dogecoin Foundation is to figure out what doge actually is and what it is going to be. Bitcoin was a tipping currency all the way up until it started gaining value. Once it passed the $2 threshold the number of tips handed out in bitcoin tapered off dramatically, and by the time the price hit $50 bitcoin faucets were the stuff of legend. Dogecoin is so popular because it is so easy to acquire; an investment of $263 could make you a Doge millionaire. Handing out tips at 5 doge increments could allow you to indulge your Daddy Warbucks fantasies for weeks. But Doge is no longer the only tipping currency on Reddit, nor is it the most popular. Reddcoin is gaining ground rapidly as they perfect their anti-hoarding algorithm “Proof of Stake Velocity” that seeks to reward Reddcoin adopters who not only have them, but actively use them. Also, Karma has become the first digital currency to incorporate, and is switching to the X11 hashing algorithm. This is a pivotal moment in Dogecoin’s history, and Coin Brief is going to follow this story as it develops. We have done something similar to Dogecoin at GCoins except you can have fun & earn GCoins without mining. This is a way in to the Bitcoin world without having tech know how or the financial clout. As users earn GCoin they will have a direct relationship and an interest. All you need is a PC or a Mobile phone. The door is now open.